This player schedule from the 4th December 1935 belonged to former Bolton Wanderers player and England international Raymond Westwood. Inside all players are instructed as to what time they are expected to arrive in London at Enfield Chase station, before heading together to the Theobalds Park Hotel in Waltham Cross from Kings Cross station. All players were also requested to bring their golf clubs for a game post matchday. Westwood was an inside forward who played 301 times for Bolton, scoring 127 goals between 1928 and 1947. He made 6 appearances for England but failed to find the back of the net. After leaving Bolton he moved on the Chester City and then Darwen. 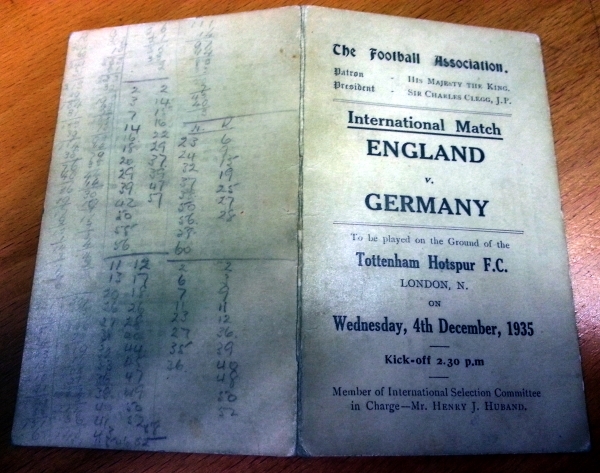 The friendly match on 4th December took place at White Hart Lane. England won the game 3 – 0 with Camsell scoring twice, and Bastin adding another.